At last count, nearly 2,000 NBA players changed teams last week before the trade deadline. Remarkably, Anthony Davis was not among them. Some of you – for instance, those obsessing over Prince Philip giving up his driver’s license at age 97 after his latest car crash – might not be up to speed on the Davis situation. Couch Slouch is here to fill in the details for you. 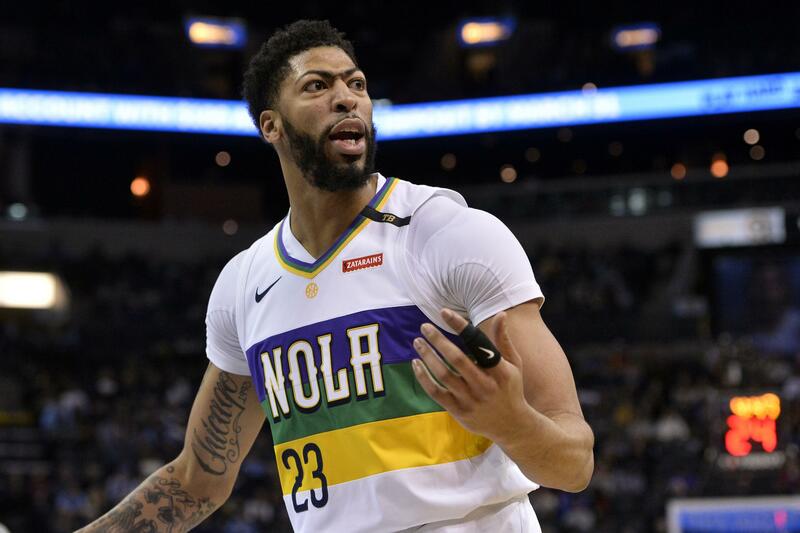 Davis recently indicated he wanted to move on from the New Orleans Pelicans. The sports media – and, frankly, the entirety of the NBA – treated this as if Warren Buffett had indicated he was leaving Berkshire Hathaway. The only thing that could’ve eclipsed the Davis news in NBA circles is if LeBron James had announced he was signing on to Elon Musk’s SpaceX mission to Mars in 2024, or if Michael Jordan had introduced a line of Nike loafers. Davis, 25, immediately was sought after by virtually every general manager in the league; 28 of the other 29 teams made trade offers for him. * In addition, all 37 Democratic presidential hopefuls offered him the vice-presidential slot on their tickets. Meanwhile, Davis let it be known that he preferred to go to the Los Angeles Lakers. The Lakers – desperate not to lose Dyan Cannon as a season ticketholder – kept sweetening their offer to the Pelicans. Their final proposal would’ve sent nearly half their roster plus draft picks to New Orleans. The Lakers reportedly were willing to trade Lonzo Ball, Josh Hart, Brandon Ingram, Kyle Kuzma, Ivica Zubac and Kentavious Caldwell-Pope – that’s a decent NBA starting five with a sixth man right there – plus two first-round picks to obtain Davis. Granted, if this deal went through, the Lakers would’ve been short of able bodies. But Staples Center sources – yeah, I’ve got sources, though most of them work outside of the arena – told me that the Lakers were planning to start Davis, LeBron, Magic Johnson, Kobe Bryant and Kareem Abdul-Jabbar or Shaquille O’Neal, with Luke Walton coming off the bench, until the 2019-20 season began. Okay, I’m kidding on this one. To smooth over ruffled feathers with all the Lakers rumored to be traded for Davis – that would be every player on the roster other than LeBron – team president of basketball operations Johnson handed out $50 gift cards to Starbucks and Burger King. The Lakers’ last proposal to the Pelicans recalled the blockbuster NFL deal in 1989 when the Dallas Cowboys traded Herschel Walker to the Minnesota Vikings for five players and six draft picks. Or the blockbuster expedition deal in 1507 when Vasco da Gama traded 202 crew members to Ferdinand Magellan for three square-rigged masts and his GPS. — The Los Angeles Clippers offered Tobias Harris, Danilo Gallinari, Shai Gilgeous-Alexander, Montrezl Harrell and owner Steve Ballmer’s kitchen sink. — The Phoenix Suns offered Deandre Ayton, Josh Jackson, Mikal Bridges, Zion Williamson (if they drafted him) and two timeshares in Sedona. — The Philadelphia 76ers offered Ben Simmons and the Liberty Bell. Even the NFL’s Oakland/Los Angeles/Oakland/Las Vegas Raiders made a bid, which included a promise to relocate the franchise wherever Davis wanted. * The Cleveland Cavaliers were the only NBA team not to pursue Davis; owner Dan Gilbert said he would just rather wait for LeBron to return. A. Indeed, this is a goal of mine, but he is currently playing pro basketball in Israel and “Slouch II” does not translate easily into Hebrew. By the way, Isaiah is averaging 10.9 points and 6.6 rebounds for Hapoel Haifa. A. I think you need to curb your betting activity. A. Not to disparage Romo – whose NFL commentary work on CBS has been fabulous – but there was a long line of people around the block correctly predicting the outcomes of my first two marriages. Published: Feb. 11, 2019, 6:54 p.m.